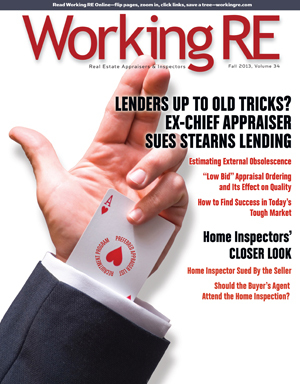 Looking over the current issue it seems obvious what ails appraisers: the marketplace is not incentivizing quality work. The system of appraisal orders by email blast used by some appraisal management companies (AMCs), as reported in Low Bid Appraisal Ordering (in upcoming issue), leads to lower quality appraisals. This is where orders go not to the best appraiser for the job but to the first one to accept it “at terms,” regardless of their qualifications. This story illustrates the fast and cheap imperative that pervades the marketplace. This reality has chased many veteran appraisers from their livelihoods. They leave because they can’t do a thorough job on “compressed” fees and stay in business, and they’d rather walk away than cut corners. The result is that many quality appraisers have abandoned their life’s work in the last few years.